I am not an expert on Peter Senge, the brilliant systems analyst who is currently a senior lecturer at MIT and who is a leading Systems Theory expert, but I am familiar enough with him to say that serious professionals, educational and otherwise, should know who he is and what he does. In his deeply engrossing book The Fifth Discipline, Senge outlines a concept of how effective and dynamic learning organizations work. He is not talking specifically about schools; Senge is describing organizations that can learn, that can grow and that are dynamic. He is detailing how people can inspired to strive for the common good of the organization – no matter what that organization is or does – and how those organization can exist in a constant and healthy state of reinvention. His conclusions, especially as applied to schools, are at once exciting and harrowing. They are exciting because Senge paints a vivid picture of what schools could be if they were built on principles that encouraged educational professionals to consider the school community overall as more important than their individual needs and desires and that supporting the broad vision and work of the school (assuming it is a high performing learning organization) actually has the effect of making their individual lives in it better. Senge’s work is harrowing because of what a tough sell that concept is. Senge outlines the five disciplines that learning organizations share, hence the title of the book. He also describes what he calls learning disabilities that can hamper learning organizations from reaching their potential. “Learning disabilities” is a bit of an awkward appellation given its current connotation, but Senge published the first edition of The Fifth Discipline in 1990, so he can be forgiven for this. As I reviewed the book for my work teaching a seminar in Jesuit school leadership this week, I found myself reflecting on Senge’s concept of learning disabilities in general and one of them in particular: The Parable of the Boiling Frog. Surely, you’ve heard this parable before, yes? If a frog is put in a pot of room temperature water on a stove and the heat is slowly and incrementally increased over a span of time, the frog will not leap from the water even as the temperature approaches the boiling point. It’s not that the frog doesn’t feel the change, the frog does. However, because the change is gradual and incremental, the frog doesn’t sense anything particularly out of the ordinary. He notes the shift in circumstance and moves on. He takes it in stride. He adjusts and adapts. He resets feeling that each rise in temperature is simply the new norm. He doesn’t leave the pot and doesn’t react to the danger until it is far too late. This isn’t a nice story for the frog, to be sure. It’s kind of disturbing, actually. But the story is all the more disturbing if we apply it to human systems. Senge says this is one of the learning disabilities that holds human systems back from being truly effective learning organizations. When things get off course in small ways, without major crises or “big” moments or institutional blow ups – when they simply slide downward, slipping inevitably, losing grip and losing focus, people in those systems tend not to notice… until it’s too late. Can this parable be applied to our academic departments? Does it describe our schools? Have we ever felt as though we were the frog in the boiling water? I think we would be well served to make a practice of “taking the temperature of the room” and discerning whether our schools, or departments, our PLCs are approaching the boiling point. We would be well served to do this early and to do it often. Looking around the room and asking, “hey, when did it get so hot in here?” may be a necessary thing to do. It may be something that needs to happen at our schools right now. But, if the water is at 210 degrees already, we can’t pat ourselves on the back for turning the burner down now. The closer we get to 212 degrees Fahrenheit, the longer it will take the pot to cool. The closer we are to the boiling point, the more likely it is that we’ve done some permanent damage. We might be able to turn down the flame before the water bubbles over, but someone is likely to have already been singed. Here’s the thing: it’s not particularly insightful, for example, to point out our schools are off track when our students aren’t scoring well on standardized tests they used to ace or that the school is off track when it doesn’t pass its accreditation review with flying colors or that the institution has a problem when enrollment dips 8%. Noting that something needs to change in light of these sorts of problems is kind of like fixing the barn door after the cow has come home… the farmer appreciates the work but isn’t going to get back the hours she spent looking for Bessie. No, the insight comes in recognition of those problems before they become problems and dealing with them prior to their coming to a head. Leadership is when the potential issues are never allowed to become issues. Check the wiring. Turn down the flame. Save the frog. Oh, and read The Fifth Discipline. 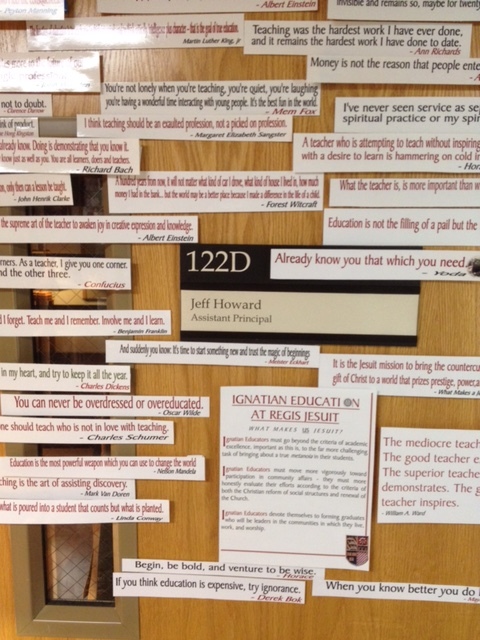 Author andtherecameadayPosted on February 10, 2016 Categories Education, Education Blog, Ignatian Education, Jesuit Education, Teach & Serve, Teacher, Teacher, Teacher Blog, Teaching, Teaching BlogTags Catholic Education, Education, Education Blog, Ignatian Education, Ignatian Educator, Jesuit Education, teacher, Teacher Blog, Teachers, teaching, Teaching Blog, Teaching Techniques, Teaching Tip, Teaching Topic7,234 Comments on Teach & Serve No. 26 – Is It Getting Hot in Here? As teachers, we cannot – must not – give up on our students. Ever. What they can do should amaze us. What they can do should inspire us. If we are not amazed and inspired by our students, it’s time to find a new profession. During one year of my administrative career, I served as Acting Principal of my alma mater, the school where I had worked for almost two decades. I could devote an entire series of posts to the perils of the words “Acting” or “Interim” before the word “Principal” and perhaps I one day will. Frankly, being an “acting” anything is an almost impossible challenge and success in the role is dependent upon many factors – especially the support one has from one’s superior. In February of the year of my acting principalship, a teacher I knew well and respected, a teacher I had when I was a student (remember, this was my alma mater), a teacher under whom I had worked in any number of capacities in my years at the school approached me. He informed me a student was failing his class and was unlikely to make a passing grade for the semester. This student had failed first semester and grading policy at our school was such that if he passed second semester, his failing grade for first semester – a grade we called the “K” grade – would become a “D” and the student would be awarded whatever grade he earned for second semester. As things stood, I was told, there was “no chance” this student would pass second semester. According to the teacher, the kid was simply not grasping the material. And he had no chance of grasping to a degree by which he could pass the class. The student couldn’t do the work, the teacher informed me. The student as so far behind the curve in terms of the material (in February according to the teacher) that the wouldn’t and couldn’t pass the class. The class was Algebra I. The student was working very hard. I should know. The student was my step-son. And the teacher was convinced, in February, that he should fail the class. That I was compromised and biased in this situation is obvious. On reflection, I see myself as entirely cowardly as well. I was principal, acting though I might be, and was within my purview to intervene. Allowing that teacher to fail my step-son in February was a mistake and it remains one of the worst professional decisions I have ever made. Frustrated and angry, not at my best and not having taken enough time to reflect on the scenario, to call in the advice of those I trusted and to challenge my step-son’s teacher’s policies, I acknowledged – I didn’t accept – what the teacher was telling me, pulled my step-son out of the class creating a study hall for him though our school didn’t offer study halls (being Acting Principal had to have some privileges) and never looked at my colleague in quite the same manner again. I have never looked at myself in quite the same way again, either. My step-son had struggled mightily in this Algebra I class throughout the first semester of his freshman year. During the first semester we tried everything. I spent many a night trying to assist him with the material. When the limits of my algebra knowledge were reached – and they were reached very quickly, my wife and I hired a number of tutors for my step-son, finding that the fit wasn’t right with most of them. We met with my step-son’s teacher searching for solutions. We explained to the teacher that my step-son had a diagnosed processing disorder and discussed how he best responded to instruction in class. Finally, we settled on a tutor who my step-son liked and to whom he responded well. For a few weeks, my step-son showed some significant signs of improvement, but circumstances changed and this tutor became less effective as assignments wore on. That my step-son’s teacher became increasingly less cooperative with the tutor is a sad but true statement. So, my step-son failed Algebra I and, by the end of that year, transferred from the school. The teacher who failed him remains. The Acting Principal who let this all go on is no longer at the school. What came next is what is instructive. Somehow deciding in the first semester of his sophomore year and his new school that he loved math, somehow deciding that he was a gifted math student despite his earlier failure and somehow deciding that he wanted to take an Advanced Placement math course by the time he graduated high school, my step-son took control. He met with his counselors and math teachers and plotted an ambitious schedule of math courses for himself over the remainder of his high school career. This plan included him taking Algebra II and Honors Geometry concurrently during his junior year, taking an online and self-directed Calculus class during the summer between his junior and senior years so that he would be ready to take AP Calculus AB his last year of high school. Oh, and he had to get A’s or B’s in these classes to satisfy his teachers and counselors. After failing Algebra I, this kid worked as hard as I’ve seen any kid work to get to a senior level, AP math class. And he took the AP test. And he got a 4. The message here is less about my step-son (and I could write post-after-post about this kid, about the incredible kid he is) than it is about the teacher who failed him. While one could make the argument that my step-son’s failure motivated him to work as hard as he did, I contend that that argument is absolutely ridiculous. Imagine what might have happened if that teacher had worked with my step-son for, clearly, my step-son had the drive and the ability to do great things. As teachers, we cannot – must not – give up on our students. Ever. What they can do should amaze us. What they can do should inspire us. If we are not amazed and inspired by our students, it’s time to find a new profession. It’s not for us to limit them. We work with them, in every way we can, to help them grow. That’s the mission. Students don’t fail in February, teachers do.